My parents have always been on the chill side with me, and with my sister. Our house is the “sleepover house”, the “our parents are friends with our friends' parents” kind of house and the, "of course you can go to the party" kind of house. There was just one rule, "no dating till college". Everything was great - until Rachit moved to our school at the beginning of class 11. His parents had moved here a couple of months ago and he was a new addition to our section at the beginning of the year only. Since my last name starts with S and his last name is Soni* - the teacher seated us together. We got along instantly and there was something playful about him that sparked something in me no other guy had been able to! We were just friends, at this point, and began hanging out a lot in a group - the usual, you know; movies, malls, cafe scenes. Four of the people in this group were dating - so that made for two couples, three other kids from school and us. One day we were hanging out in the library, during lunch time, because I had a test to study for. Rachit was being his usual annoying self and doodling on my leg - this was a normal thing and I found it quite cute so I never stopped him. "Rach" "Lame" "Nerd" - these were the types of things he would write. Thinking back, it wasn't about the content he was writing - he just used to find excuses to right higher and higher up the hem! Anyway, that day he had written, "girlfriend?" - simple and to the point but it made me smile and I said yes! Also read: What Happened When His Landlady Caught Us Making Out…! Now, to break the news to my parents. Their rule - "No dating till college." Time left until college - Just under a year. Great! How was I going to pull this off? I asked my sister for help who ended up exchanging her silence for my allowance that month... Siblings - Totally useless! I thought about getting myself intentionally caught by letting my parents see the markings on my legs. And then I would have to explain the situation… But then I thought, why add the fact that he writes on my leg to an already delicate conversation! Hardly something my dad would want to hear! Finally, one night when we were hanging out in the mall, my mom called asking when I would be home for dinner. I took my chance and said I would be home in half and hour and asked if it was okay if I could bring a friend over? She agreed - not suspecting anything. Now, I have had guy friends over for dinner and it's been chill. Dad pulls the embarrass-your-daughter routine, mom asks a thousand questions about their families and Nina (my sister) tries to act older than she is. "So why should tonight be any different?" I thought to myself...perhaps a bit too casually and optimistically! Rachit agreed to dinner, it had been over three months since he had asked me out and he agreed meeting the parents would be the best way to handle things and take them forward! Dinner was exactly as expected - better because dad ended up knowing one of Rachit's dad's seniors in school - a mutually close family friend to us both. Nina didn't help anything and kept trying to get us caught - though luckily my parents weren't listening to her enough to react!! After dinner, I went to sit with mom in her room and started talking generally about school and Rachit and what she thought of him? Now, mama ain't no fool!! She caught on pretty quick and asked if there was something she should know? I smiled and gave it away without saying anything. She didn't seem pissed off, but telling dad was upto me and she wasn't going to interfere. Ugh, talking to dad about this was going to be embarrassing enough. I had never spoken to my dad about boys in the past and really didn't want to ever! I thought about it and decided to ask his permission, "Would it be okay if I had a boyfriend?". Something on my dad's face told me this was NOT a conversation he was ever hoping to have either! After not saying anything for half a minute - that seemed like half an eternity - dad put down his paper. Also read: What Happened The First Time We Went On A “Romantic” Holiday! "That Rachit fellow?" he asked. "Ya.." I replied, calmly taking solace in the fact that our connection was evident - even to my parents. "Invite him to dinner again, let's get to know him." Okay, so not a yes but definitely not a no either! 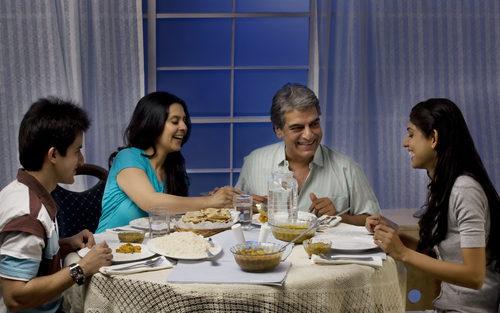 Rachit came over for dinner a couple of more times after that and he seemed to get along well with the family. It never seemed tense, even after revealing that he was more than a friend. My parents - well my mom (but I'm guessing they had a chat about it) - communicated to me that it was cool for Rachit to come over for dinner once a week and for me to hang out with him alone after school once a week too! She told me my school work shouldn't suffer and that I should keep my priorities straight and not have my head in the clouds and that during exam time he would be treated as a normal friend and things would be different (which meant no hanging out during weekdays). Totally reasonable, I thought. So I hugged her and reassured her that nothing would suffer! !